When you make a new kale salad for lunch and your husband not only willingly eats it but comments “Oh, wow this is good!” You know you’ve got a winner of a recipe. That’s exactly what happened this past week. Now granted, the name of this recipe gives great insight as to why we thought it was so spectacular: Steak House Kale Salad With Hot Bacon Vinaigrette. Boo yah! Yes it contained bacon and yes, that makes it tasty. But this salad is one of those magical combinations of ingredients that just work. 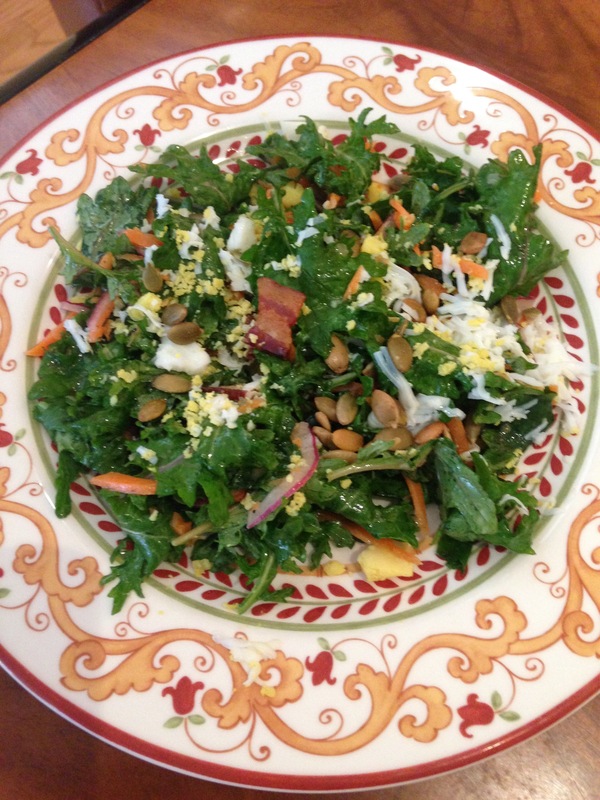 Everything comes together beautifully for a yummy addictive salad. And in my view, the kale and other veggies cancel out the three slices of bacon used in this substantial salad that feeds four. That’s my story and I’m sticking with it! The only problem is that, for the life of me, I can’t determine where I pulled the recipe from so I am unable to give proper credit. But regardless, this is a salad that I will be making year-round on a very regular basis. Cook bacon in a skillet until crisp; transfer to a paper-towel-lined plate and discard drippings. Heat oil in same skillet; add shallots and garlic and cook until softened, 3-4 minutes. Whisk in vinegar, sugar, Dijon, and thyme; season with salt and pepper. Reduce heat to low and keep vinaigrette warm. Toss kale mix, carrot, and onion with vinaigrette to coat. Garnish servings with pumpkin seeds and egg.